308 pages | 137 B/W Illus. Widely employed for separating and detecting chemicals in solution, separation techniques are most often applied in tandem, subsequently referred to as hyphenated methods. Hyphenated and Alternative Methods of Detection in Chromatography details the development and application of mass spectral detection techniques coupled with gas phase and liquid phase chromatographies. With contributions from experts in a variety of fields, as evidenced by the range of topics, the book describes the advantages and disadvantages of various separation techniques and addresses methods for cutting-edge applications such as proteomics research. A detailed reference for those starting out in the field, this book also suits those who are more experienced yet require assistance in new directions. It is an ideal reference for senior undergraduate and postgraduate students wishing to supplement their learning experience. 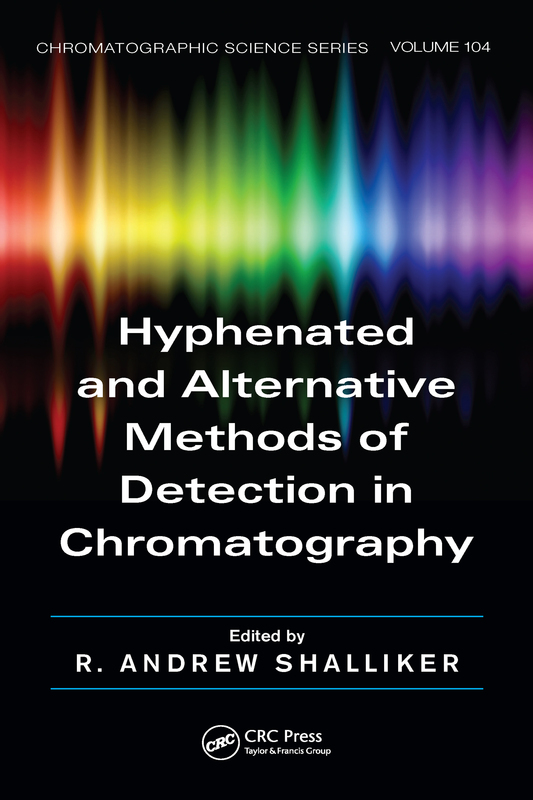 Containing over 800 references, this book is an excellent source of information within the field of hyphenated methods of chromatographic analysis. Dr. R. Andrew Shalliker received his Ph.D. in 1992 and his BSc (Hons) in 1987 from Deakin University, Geelong, Australia. He joined the University of Western Sydney (UWS) in 1999, and is currently an Associate Professor of Analytical Chemistry. Prior to joining UWS, he was a research fellow in Professor Guiochon’s group at the University of Tennessee, Knoxville,, and Oak Ridge National Laboratories, Oak Ridge, Tennessee (1997–1999). From 1995 to 1997, he held a Queensland University of Technology (QUT) Postdoctoral Research Award at QUT Brisbane. In 1994, he was an Associate Lecturer of Analytical Chemistry at the University of Tasmania, Hobart. Between 1992 and 1994, he was a research chemist at Faulding-David Bull Laboratories, Melbourne, Victoria, Australia. Dr. Shalliker’s research interests are in the field of liquid chromatography. He has published over 100 scientific papers in this field, focusing on the areas of column technology, stationary phase design, multidimensional HPLC, polymer and oligomers separations, and the analysis of natural products employing chromatographic separations. In 2007, his research team joined the research groups at UTAS and RMIT as a member of the Australian Centre for Research on Separation Science (ACROSS) consortium.